Are you looking for a fun, quirky, unusual and original hen party idea for your Brighton hen do? Why not try hula hooping! Perfect for a day time hen activity before a night out on the town. Have the best hen party ever! We’ll start by learning to hula hoop on the waist but that’s not all! You’ll spin a hoop on your hands and arms and maybe even try your neck or feet. By the end you’ll all be flicking your hoop around like pro’s. No experience necessary so don’t worry if you’ve never spun a hoop before or not since you were a kid. Hen parties are about having fun and bonding before the big day, so there’ll be lots of silly games to warm you up and get you all laughing. Hoop races, hoop gladiators and hoop scotch are just a few that we throw into the mix. Pumping tunes are where it’s at! Feel free to request the bride’s favourite song or era (hello 80s!) and we’ll be sure to put it on our playlist. Once you’ve learned some hoop skills we’ll put together a group routine that you can film as a memento of the day. Some hen parties have gone on to perform hoop routines at the wedding! While we do not advise pregnant women to hulahoop on their waist or to overexert themselves, if you are fit and well we have lots of off-body options so you can still be involved in the party. We sell beautiful hoops that you can order as a gift for the bride. Just let us know her fave colour and we can bring it along to present to her at the end of the class. Or order a whole stack so all the hens get one each to practice with. We are based in Brighton and Sussex but we have trained instructors all around the country including London, Manchester, Bristol, the Midlands and more! Just let us know where you’ll be and we will find a fabulous hoop teacher for you! 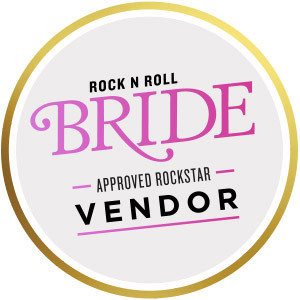 We have the Rock and Roll Bride tick as an approved vendor! Our favourite blog for alternative and quirky brides featured Jo and Andy’s hooptastic wedding. We bring all the hoops and the music and can organise a venue for you in Brighton or Hove. Just use the booking form below and we’ll get your hoopy hen party happening!